The Jewel Tibbetts Arch trail is located in Hell Roaring Canyon on land that is managed by the BLM. The arch is named after a woman who once ranched in the area with her husband in the 1950's and 60's. 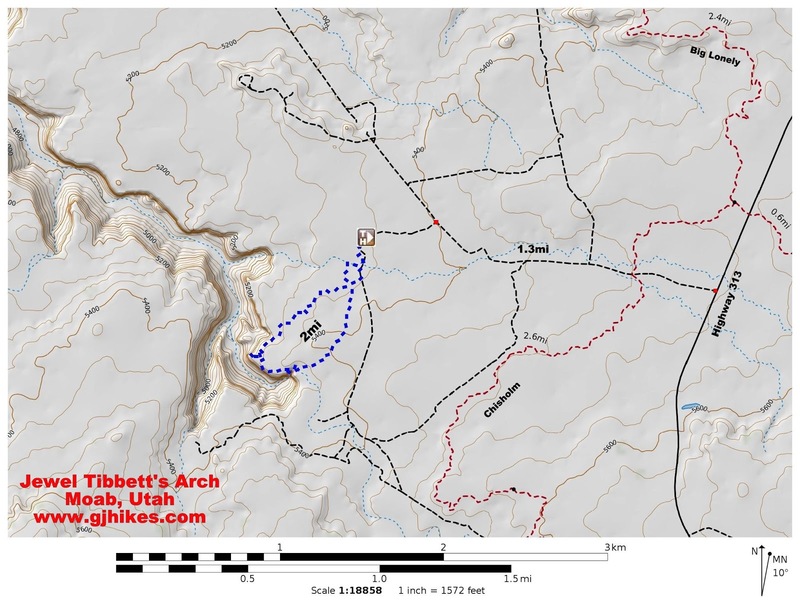 The Tibbetts would take visitors to their ranch, that was located about 10 miles away, to see the arch. Hell Roaring Canyon drains a large area of land into the Green River about 12 miles distant. 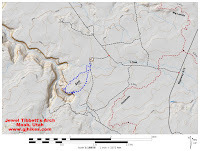 The turnoff to Jewel Tibbetts Arch can be found along Highway 313 about 10 miles west of the Highway 191/313 junction. The turnoff is to the right just before a cattle guard. Highway 313 is the road that leads to Dead Horse Point State Park and the Island in the Sky District of Canyonlands National Park. From the turnoff it is another 1.3 miles down a dirt road to the trailhead. A vehicle with a little bit of clearance would be advised. It would also workout well to drive in a short distance, park, and ride a mountain bike the rest of the way. This area is popular with mountain bikers anyway. The trailhead is well marked with a kiosk full of information about the area and the arch. The trail follows the road as it starts out. 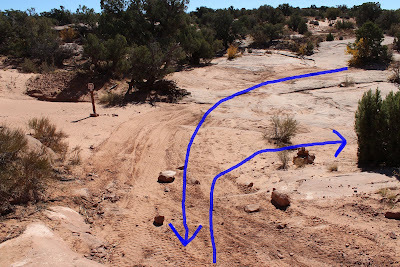 The loop begins a short distance down the road where it drops into a wash. Follow the cairn on the right into the wash.
Watch for a trail sign on the left hand side of the wash where the trail makes its exit. The trail between the wash and Hell Roaring Canyon is well marked with more cairns. This picture is looking back at a shelf the trail goes over. Most hikers probably hop right down it but those with less than perfect knees may choose another method. When the trail comes near Hell Roaring Canyon it follows the slickrock ledges toward the head of the canyon. A trail sign marks a short spur that you can follow to an area along the rim where you can get a closer look at the arch and the canyon. The arch is actually fairly big but it has so much overburden and it is far enough away that it makes it harder to appreciate. The canyon looks like it may be a lot of fun exploring. One of the signs at the trailhead mentions that uranium miners prospected the canyons Chinle formation during the 1960's. After viewing the arch the trail continues around the rim of the canyon. There are a few other spots that also offer good views of the arch. Its not too often that you see two alcoves side by side. They look like they would be fun to explore but the canyon walls are pretty high at this point. The trail moves back on top after reaching the head of the canyon. The trail is less distinct in the places where it goes through the sagebrush. There are a few well placed mylar posts that mark the way. We came across an old campfire that had a few chips of chert that had obvious knapping marks. The charcoal was mostly covered with sand but our best guess was that it was an old Indian campfire. There is probably nothing really exciting about the arch by itself but the trail is fun to hike. It is definitely away from the crowds of Arches and Canyonlands. The upper canyon area has a playground feeling and is fun to explore. Most of all though, if someone tells you that you can go to a place called Hell Roaring Canyon and see an arch, doesn't that get you just a little excited. If you would like to see it for yourself then all you have to do is 'Take a hike'.